We carry TREperformance OEM replacement fuel pumps for all Triumph vehicles including TR7 and many others. 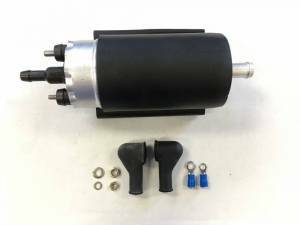 These are OEM replacement style pumps and will be a direct fit replacement in the stock fuel pump housing, although some minor modifications may be needed on the plastic housing or wiring. We include a universal kit with every pump containing everything pictured. Please compare and research install before purchasing. All TREperformance fuel pumps have a 1 year warranty.